As he promised on December 6, 2017 President Donald Trump of the United States of America to relocate the American embassy to the city of Jerusalem as the capital of the nation of Israel he followed through and did it. The significance of this cannot be underestimated. Jerusalem is mentioned more than any other city in Scripture: more than 800 times. It is named in 660 verses in the Old Testament, and in 142 verses in the New Testament. Jerusalem appears in some two-thirds of the books of the Old Testament, and almost one-half of the books of the New Testament. While Jerusalem is its most common title, it also occurs under other names such as Zion, Salem, The City of David, and Ariel. It is symbolically named in allegory as “Hagar and Mount Sinai in Arabia” (Galatians 4:25) and in prophecy as “Sodom and Egypt” (Revelation 11:8). Of the over 800 biblical references, 465 in the Old Testament and 24 in the New Testament refer to prophecies of Jerusalem yet future to the time they were stated. 18And Melchizedek king of Salem brought forth bread and wine: and he was priest of God Most High. 19And he blessed him, and said, Blessed be Abram of God Most High, possessor of heaven and earth: 20 and blessed be God Most High, who hath delivered thine enemies into thy hand. And he gave him a tenth of all (ASV, 1901). Jerusalem, formerly known as “Salem” first appears in the book of Genesis in the Bible where “Melchizedek, the king of Salem” blessed Abraham, the first Hebrew. “Melchizedek” is one of the most interesting characters in the Bible. Here he is said to be “priest of the God Most High”, and this is the first mention of a “priest” in the Bible. The title “God Most High” in Hebrew is El Elyon. This Hebrew title of God is found three times in these verses. It is only found elsewhere in once in Psalm 78: 35. Frequently we find the phrase “Most High” in other Bible passages, but only here and in Psalm 78 do we see the phrase “God Most High.” This designation has special significance, and verse 19 specifically states that God is the “possessor of heaven and earth”. It also means that Jehovah God had a relationship with “Melchizedek”, for “Melchizedek” was a follower and minister of the Lord of Heaven and Earth. Here “Melchizedek” is said to be both a priest and a king. Abram acknowledged Melchizedek as his superior, and seemed to recognize that God had revealed Himself to this man. In the New Testament and Psalm 110, “Melchizedek” is treated as a type of Jesus. He is never seen as the Lord Jesus. A type is an example or model of something else. The book of Hebrews says he was like the Son of God (Hebrews 5,6,7). What is important to realize is that Melchizedek is a representative of God as the text says “priest of the God Most High.” Abraham recognized this and gave Melchizedek a tithe of one-tenth of all he owned. God Says Jerusalem is His Dwelling Place. 1In Judah is God known: His name is great in Israel. 2In Salem also is his tabernacle, And his dwelling-place in Zion. 3There he brake the arrows of the bow; The shield, and the sword, and the battle, Selah (ASV, 1901). 2Jehovah loveth the gates of Zion More than all the dwellings of Jacob. 3Glorious things are spoken of thee, O city of God (ASV, 1901). “13For the Lord has chosen Zion; He has desired it for His habitation. 14This is My resting place forever; Here I will dwell, for I have desired it” (ASV, 1901). As a result, Jerusalem is both the Holy City, and the city at the center of the world (Ezekiel 5:5). “2Moses my servant is dead; now therefore arise, go over this Jordan, thou, and all this people, unto the land which I do give to them, even to the children of Israel. 3Every place that the sole of your foot shall tread upon, to you have I given it, as I spake unto Moses. 4From the wilderness, and this Lebanon, even unto the great river, the river Euphrates, all the land of the Hittites, and unto the great sea toward the going down of the sun, shall be your border” (ASV, 1901). “1The earth is Jehovah’s, and the fulness thereof; The world, and they that dwell therein, ” (ASV, 1901). “6And the king and his men went to Jerusalem against the Jebusites, the inhabitants of the land, who spake unto David, saying, Except thou take away the blind and the lame, thou shalt not come in hither; thinking, David cannot come in hither. 7Nevertheless David took the stronghold of Zion; the same is the city of David. 8And David said on that day, Whosoever smiteth the Jebusites, let him get up to the watercourse, and smite the lame and the blind, that are hated of David’s soul. Wherefore they say, There are the blind and the lame; he cannot come into the house. 9And David dwelt in the stronghold, and called it the city of David. And David built round about from Millo and inward. 10And David waxed greater and greater; for Jehovah, the God of hosts, was with him” (ASV, 1901). In the prophecy of Ezekiel 37:1-14 the valley is covered with bones. Ezekiel also makes the observation that there was a large volume of the bones, and they “were very dry”. These bones were scattered about and not in piles. This is an indication that they were not produced in a single event, but over a great length of time, and no vivid life had been in them for an extended period. For example, from the time of the last invasion of Nebuchadnezzar in 586 B.C. to the rebirth of the nation Israel in 1948, Israel had been without life for 2,534 years. This is quite in keeping with the Lord statement of “The Times of the Gentiles” (Luke 21:24). Any Jewish takeover of the city before the Second Coming is temporary, because Jerusalem will be trodden down by the Gentiles for at least another 3 ½ years during the Great Tribulation (Revelation 11:1-2). Thus, the current situation of Jerusalem as of 2017 does not mean that “the times of the Gentiles” have ended. “The times of the Gentiles” can only end when Gentiles cannot “tread down” Jerusalem any more. 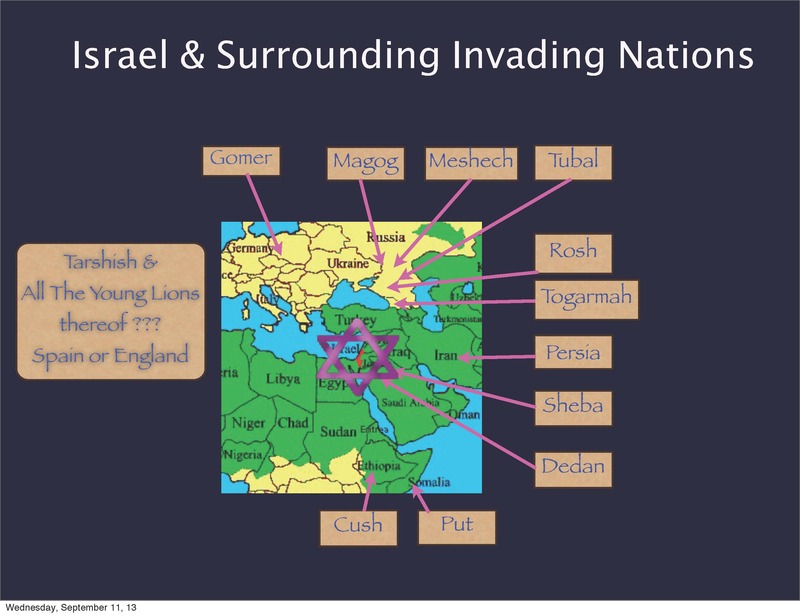 “The times of the Gentiles” is also the period of time when Gentile empires will follow one another in sequence, with the Fourth Empire of imperialism going through several different stages. But eventually this will give way to God’s setting up His Own Kingdom. So even though the Jews won through battle in 1967 the control of Jerusalem, their presence there has been disputed by the eastern block of nations, including Russia and the Islamic nations. The affirmation of Jerusalem as the Israeli capital city by the United States is one link in the sequence of events in “The times of the Gentiles”. It is important to realize that the United States, through President Harry Truman, was one of the first nations to recognize the modern state of Israel in 1948 after they declared their independence. Now President Donald Trump is officially recognizing Jerusalem as Israel’s capitol. These affirmation of Israel, and Jerusalem’s sovereignty, are much in keeping with the blessings promised in the Abrahamic Covenant. The Abrahamic Covenant is the first unconditional covenant that God made with Israel. The Abrahamic Covenant promised a seed, land, and blessings. As such, these three major promises of this Covenant were personal promises to Abraham, national promises to Israel, and universal promises to all the people of the earth. God promised that He would bless Abraham and make him a blessing to others, to make his name great, to give him many descendants, to make him the father of a multitude of nations, to give him the land of Canaan for always and to “bless them that blessed Abraham and to curse them that cursed him” (Genesis 12; 13; 15 & 17). God also made national promises concerning Israel. 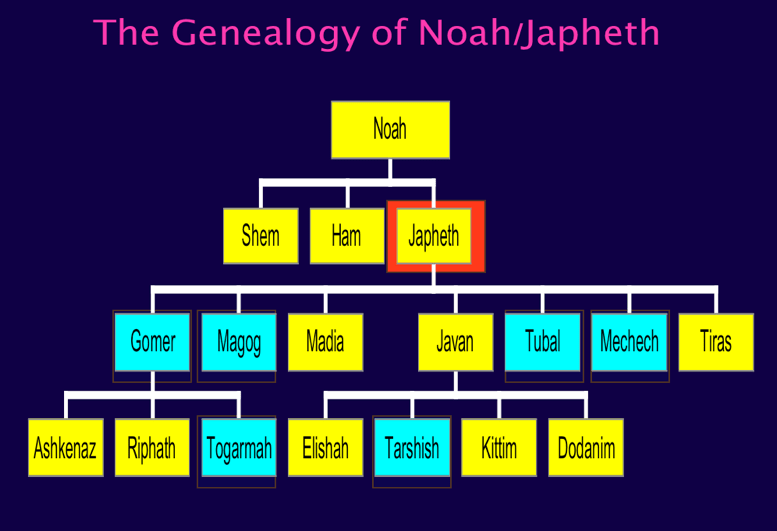 They are to make a great nation of his descendants, to give land from the eastern most branch of the Nile delta (called the river of Egypt) to the Euphrates to his descendants forever, and to give the Abrahamic covenant to his descendants forever (Genesis 17:19; 21; 26:2-4; Genesis 28:12-15). As a result of these promises, we can see the period after the Second World War as having unprecedented prosperity to the United States of America, thus fulfilling God’s promise to bless those who bless Israel. We can look forward to addition prosperity following President Trump’s affirmation of Israel’s capitol as Jerusalem. However, as expected, the Muslim Arab nations are violently reacting to President Trump’s declaration. This may trigger the allied invasion as described in Ezekiel 38 & 39. It will at the very least cause the allies of Russia to desire the invasion in an ever more urgent manner. The world is setting the stage for this prophecy to be fulfilled by various peace negotiations, demanding that Israel give up land, and most importantly, constantly threatening their security. The biblical text as stated in Ezekiel 38:1-39:16 describe an invasion of Israel from the north, and the subsequent total destruction of the coalition of invading forces once they reach the area of “the mountains of Israel”. It appears that there is a preemptive attack by the Israelites with a nuclear weapons exchange that results in a seven-year clean-up period. The unidentified person who will be leading this alliance is named in Ezekiel 38:2 as “Gog”. Some have referred to Vladimir Zhirinovsky, the notorious Russian Jew hater, as the one who would be “Gog”. It could also be Vladimir Putin, the present Russian president, or some other person. God’s love for Israel underlies His promises to protect them and His Land by decimating the invaders of His land. God Almighty has had enough, and His fury is unleashed. This invasion of Israel is equilivant to the cup of iniquity being full, the apple of God’s eye being touched, and the Wife of Jehovah being violated, thus arousing God’s anger so that He moves out in judgment to destroy the invading army. Several causes of destruction are listed, and these include an earthquake civil war breaking out among the invading soldiers, pestilence, blood, flood, hailstones, fire, and brimstone. Since these things totally destroy the invading army without the aid of other nations, God’s purpose is seen as succeeding in its objective. God is indeed sanctified in the eyes of many people. This invasion is immanent and could occur at any time. With the recent announcement of moving the United States embassy to Jerusalem, the Muslins have been rioting, and shooting rockets into Israel. Russia has been relatively quiet, only making slight affirmation of disagreement with the United States’ announcement, and thus affirming their allegiance to their Muslin allies. Once this invasion occurs it will trigger a major step in “the times of the Gentiles”. It will remove all the eastern bloc Islamic nations as well as Russia from political prowess on the world stage. This will pave the way for super dominance by the western democracies, and usher in the one world government. Later following this, the Antichrist will emerge as the sole leader. Both Daniel passages in Chapters 2 & 7 make it clear that the Fourth Gentile Empire begins with the end of the Third Gentile Empire, which was Greece, and continues until Messiah comes to set up His Kingdom. The Fourth Empire is an Imperialistic Empire. Imperialism is simply a policy of extending a country’s influence through diplomacy or military force. This Fourth Empire is diverse from all the rest. It goes through five distinct stages. Rome is only the first of the stages. Rome is not the name of the successive stages. I realize that some Bible teachers believe that there will be a revival of the old Roman Empire, but the text never says this. It is man’s speculation that leads to that idea. What Rome did that was different than all the other empires was to establish the imperialist form of government. It is this form that the Bible speaks of as the Fourth Gentile Empire, not just Rome. There is no break or gap in the imperialist form of government on the earth from the initiation of the Roman Empire until Christ returns. Nowhere in Scripture is this stated. This form will go through five successive stages. We need to study those to see where history fits in this exposition. The United Stage-Rome is the first stage of the imperialist form of government. The first stage, or the United Stage, started about 43 B.C and lasted until A.D. 364. However, there were five types of government that Rome went through from its origin and subsequent development, which is referenced in Daniel chapter seven. The second stage or the Empire of Imperialism was the Two Division Stage. This stage was foreseen by Daniel 2 (Legs of Iron), but not by Daniel 7. It began in A.D. 364 when Emperor Valentinian divided the Roman Empire into an east and west division. There was an earlier division in A.D. 285 that was of short duration. The Emperor Constantine in A.D. 312-313 reunited the empire. The A.D. 364 division was permanent. The Western Headquarters was in Rome and the Eastern Headquarters was in Constantinople. This lasted until A.D.1453 when it collapsed in the Turkish invasion. When Constantinople fell the political rulers, scribes, and scholars fled north into Russia, infiltrated the government there, and set up an imperialist form of government. The rulers called themselves Czars, which is Russian for “Caesar.” Later Russia began calling itself the Third Roman Empire. Eventually the eastern balance of power was centered in the Soviet Union and included the Communist block of nations. When European communism collapsed, the eastern balance of power shifted to Russia and the Commonwealth of Independent States (CIS). Presently power transfers are still occurring, with Islam becoming a major eastern power. More settling is sure to occur in the future until this Two-Division Stage gives way to the as of yet future One-World Government Stage (The Allied Invasion). The western division of power remained in Rome from A.D. 364 until A.D. 476 when Rome fell. From there it shifted to France, especially the power gained by Charlemagne in A.D. 800. He called his domain the Holy Roman Empire of the Frankish Nation. In A.D. 962 Otto I of Germany defeated the Franks and set up the Holy Roman Empire of the German Nation. The leaders called themselves Kaiser, which is German for “Caesar.” Since then, especially after World War I, the western balance of power has been centered in the democratic nations of the west. So, the Two-Division Stage, which began in A. D. 364, continues to this day and there may be some shifting yet to come before the east-west balance becomes the third stage. All the remaining 3 stages of the Empire of Imperialism are yet future to us today in 2017. Daniel 7:23 clearly states that at some time the Fourth Empire will “devour the whole earth”. Rome never did this. Rome did not even extend to the borders conquered by the Greeks under Alexander the Great. The Imperialist form of government will at some time exercise control over the whole earth. Rome must not be seen as the total of the Fourth Empire, but as only one stage of the Empire of Imperialism. The Allied invasion of Israel, which will occur prior to the Great Tribulation, will cause the Russian and Muslim nations to lose their authority. (Ezekiel 38:1-39:16) This event will give way to the One-World Government Stage. 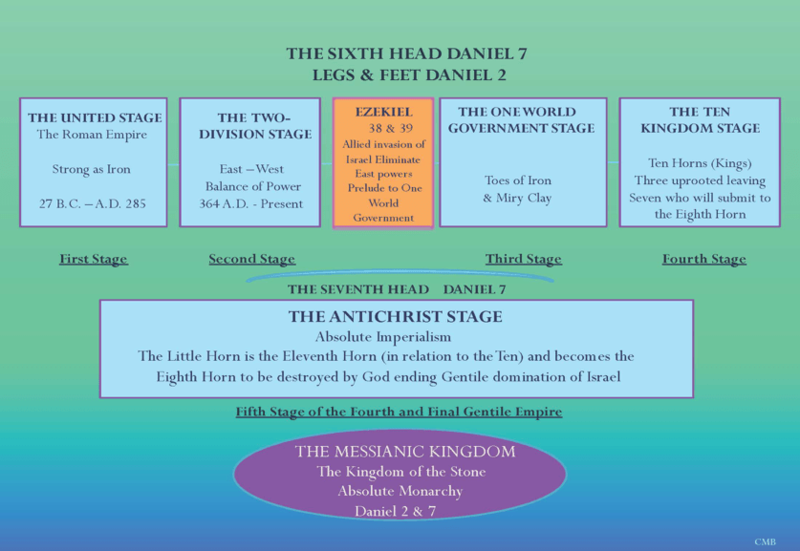 The Ten-Division Stage is seen in both Daniel 2 with the ten toes, and in Daniel 7 with the ten horns. This stage is clearly stated to come out of the One World Government Stage. The Bible is silent as to why the division occurs. These ten kingdoms will cover the entire earth and not be limited to some specific continent such as Europe. They will begin sometime before the Great Tribulation, and continue into the middle of the Tribulation. To be consistent with Daniel’s prophecy, perhaps one could consider the Club of Rome’s recommendation that the world be divided up into ten administrative districts to avoid economic collapse. The Club of Rome is a global think tank, and center of worldly innovation and initiative. As a non-profit, non-governmental futurist organization, it brings together scientists, economists, businessmen, international high civil servants, heads of state and former heads of state from all five continents who are convinced that the future of humankind is not pre-ordained, and that each human being can contribute to the improvement of our societies. The Antichrist Stage follows the Ten-Kingdom Stage. The Antichrist rises to power during the Ten-Kingdom stage, uproots three of the ten kings, and the other seven submit to his authority. This then becomes the Stage of Absolute Imperialism. Once this submission occurs the Antichrist Stage officially begins. This stage is the fifth and final stage of Gentile World Imperialism. It is very valuable to understand the course of “the times of the Gentiles” so we can get an understanding of biblical eschatology itself, and see that various world events clearly fall into line with God’s overall Plan.